It’s been nearly six years since I reviewed two singles for World 5, “Maybe There’s A Way” and “Man Of Action”: https://skopemag.com/2013/09/18/world5-maybe-theres-a-way-man-of-action. I knew then how unique and talented this group of players were and so I knew I hadn’t heard the last of World 5. I’m ecstatic to hear that this band is back with a brand new song titled “Be You” that is the first single off of the upcoming, third studio album from World5. Everything feels right again because this worldly bunch is doing exactly what they should be doing and that is making high-quality, catchy music for the masses. Literally spanning continents with members from all over the map, World 5 is able to provide such a vast sound & style that you won’t hear on everyday Pop stations. This is what makes this band stand out because they make culturally-rich music that is also trendy. The current lineup includes: Lou Evans on lead vocals & guitars, Joe Gavito on guitars & keyboards, Steffen Goeres on guitars & trumpet, Jimmy Olsson on bass and Raimund Breitfeld on drums & percussion. Together, these well-versed musicians have created pure magic with “Be You”. As soon as you hit Play, you will have a super smooth sensation hit you that is beyond cool and Too “Hip to Be Square”, (Huey Lewis and the News). Lou Evans sings with such clarity and proves to be a poised vocalist that even exhibits a soulful touch to his voice. Add in top-of-the-line playing from all band-mates as I’m witnessing extreme precision from all instruments. The musical chemistry is just a thing of beauty here on “Be You” where World5 is making a true believer out of you and me. The track is a snappy, Pop/Rock tune that is loaded with appeal and proves to be a real crowd-pleaser. With a driving rhythm and uplifting vibe, “Be You” is everything you would want in a great song from rhyme or reason to heart & hope. The listener will pick up on lyrics like “You will persevere…Be the one your soul shines through”, which will make you feel so full & complete. This positive, loving message is just icing on the cake in what already is a dynamite song overall. And to purchase the song or to find out more about the fresh ‘n’ dynamic World5, visit their website below. Be the CHANGE and most importantly “Be You”; this is one YOU don’t wanna miss! The bands former album releases were “Global Experience”, on Island Def Jam Digital and “Heartbeat Of The World” on Spectra Records /Spectra Music Group. 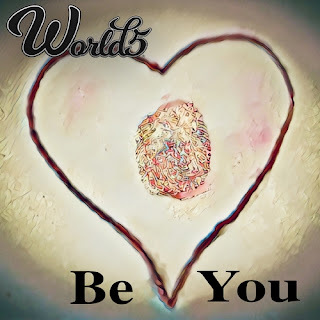 “Be You” by WORLD5 is available online worldwide March 8., 2019. The single “Be You” is distributed globally by Spectra Music Group and is available at iTunes, Amazon and many other outlets for convenient purchase and download. The band´s third studio album will be released in autumn 2019.